PMU Betting Guide and Information Where to bet? A service offered on all bets except Simple that select all or parts of the horses for the punter. Pariez SpOt system selects the horses for the punters according to the bets already registered. The more a combination has been played, the higher its chance to be selected by Pariez spOt. For bets in exact order, the ‘cheval de complément’ will take the last position in the event of a non-runner. For ‘any order’ bets, the reserve horse will take the place of the non-runner. Free option available for all the bets (except Simple, Multi and Mini-Multi). The punter pays for just a fraction of the cost of the bet. If he wins, he collects a corresponding fraction of the dividend. The good deal: more combinations for a reasonable price, winning chances are increased! 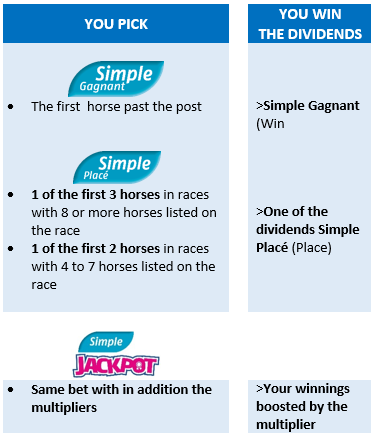 With the Flexi formula, the total stake should be at least equal to the minimum stake of the bet. Flexi can be combined with Partial or Total Wheel, Combiné or Box formulas. 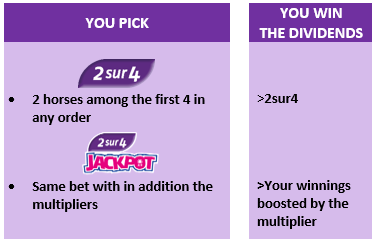 More combinations, more chances to win the different dividends! The punter has already selected his favorite horses and wants to combine them with a selection of other horses to reduce the risk. Benefit: This formula will associate the favorites with a selection of horses the punter may consider as ‘second chances’. More winning chances, less risk! Available for all bets except Simple. The number of horses from the selection is higher than the required number for the bet. The punter can include more horses than required for a unit bet to increase his chances of winning. The punter is sure of his favorites but needs to select more horses to complete his bet. He has no preferences for the remaining horses. Benefit: The Champ Total formula combines one or several horses with all the other horses in the race. Once the favorites selected, the punter hesitates on the placing. 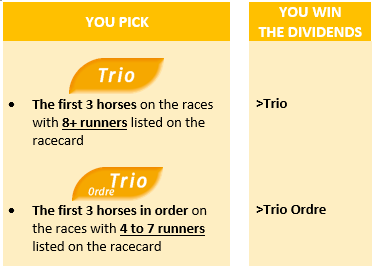 The horse selection can be placed ‘in every order’, i.e., every possible permutation is played. This formula is available for a unit bet, Combiné or Champ bet.